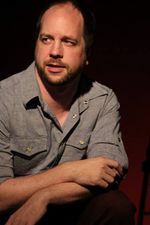 Justin Bozied (formerly Justin Davis) is an improv performer, director, and teacher. He first took classes at The Hideout Theatre from 2006 to 2007. Justin was a founding member of The Starter Kit, an improv troupe that lasted four and a half years before splitting up mainly due to multiple members moving away from Austin. A decided shift in his performing style happened around this time, and he pursued more opportunities behind the scenes as a director, producer, creator, and instructor.